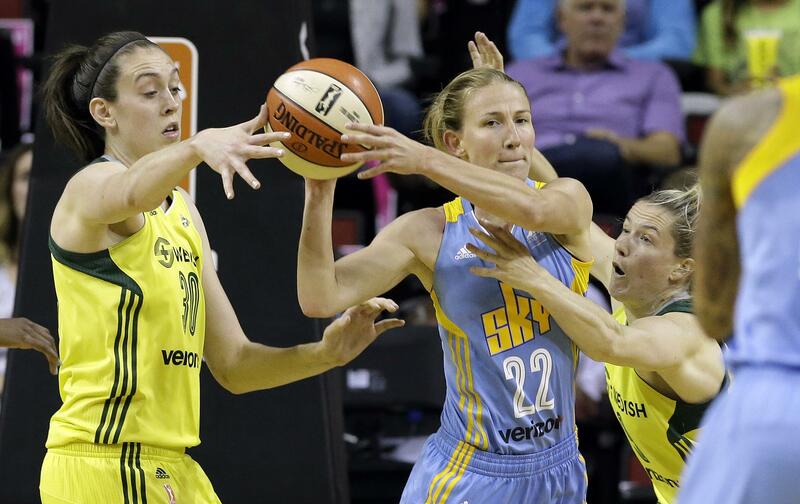 SEATTLE – Allie Quigley scored 25 points and Keisha Hampton had a season-high 14 to help the Chicago Sky beat the Seattle Storm 94-83 on Tuesday night. Chicago trailed 31-11 early in the second quarter but got within 42-41 after Tamera Young’s back-to-back jumpers to close the half. The Sky took their first lead, 43-42, on Young’s basket early in the third and Quigley scored 11 points in the quarter. She matched her career-high with six 3-pointers. Kahleah Copper’s three-point play gave Chicago an 81-72 lead and after a Seattle offensive foul, Copper made a hook shot in the lane. Young finished with 11 points for Chicago (7-13), which outscored Seattle’s reserves 42-8. Breanna Stewart had 25 points and 11 rebounds for Seattle (9-11), which turned it over 18 times. Crystal Langhorne entered needing five straight field goals to tie Nneka Ogwumike’s WNBA record of 23. She made her first three shots before missing an open jumper near the free-throw line. Published: July 18, 2017, 8:12 p.m.